My husband Bart, is an Air Force Pilot and stationed at the Pentagon. Our daughter Alexandra (Allie) is 22 months old. Our fur baby Hercules, (Heky) is a five year old English Bulldog. Home: What a loaded question for this military kid. I am a Texas born military dependent that lived in nine different places before graduating high school. My parents were born and raised in Alabama, so most summers and vacations as a kid were spent visiting my extended family there. I attended Auburn University (four years here was the longest I lived anywhere) and claim the south as home. So the short answer is I’m a southern gal that traveled the world thanks to an Air Force dad. NoVa: I was assigned to the Pentagon in 2010 and shortly after met my husband, who was living in Baltimore. After our wedding, we moved into our first home in Arlington and plan to make Virginia home (for now). I am a nomadic coach and teach at all our locations, however, you can find me most regularly on the weekends in Woodbridge and Lorton for both Stroller Strides and Body Back. While on maternity leave, I saw an ad for Fit4Mom on Facebook. I signed up and attended my first Stroller Strides class when Allie was 3 months old in Kingstown…I was hooked! Most of my mom friends lived all over the world (thanks military) so I desperately seeking out a mom network. Within one hour, I met other mamas going through the same struggles, asking the same questions and seeking the same purpose all while singing fun nursery rhymes and doing bicep curls. After my first class, I immediately contacted Shannon and inquired about coaching. 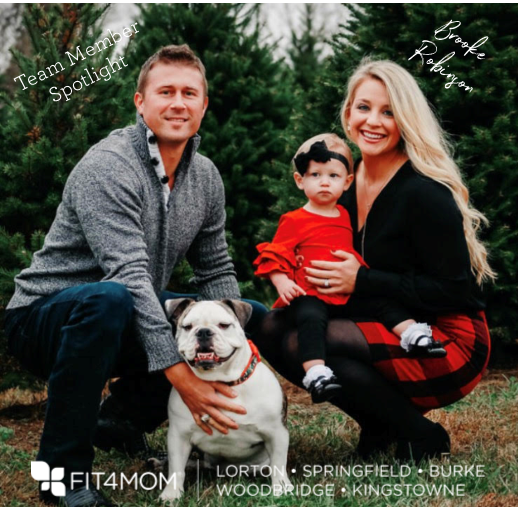 In the military I had led physical fitness classes, but knew I wanted to be a part of the Fit4Mom mission that empowers mothers to be the best version of themselves! I love coaching Body Back HITT rounds classes. It is motivating to share simple body weight moves (while blasting fun music) that can change your whole body, mind and spirit! Sharing these tools with other moms, gets the whole family moving at home, on the road, on vacation and leads towards an overall lifestyle change. It gives me so much joy to see other moms smiling, while pushing their limits! The best part about being a coach is working in a positive, uplifting environment, either outside in the fresh air and sunshine or in a colorful gym. I am honored to help mamas maximize their one hour of ‘me-time’, because the best version of YOU leads to being a better wife, mom, daughter, sister, employee, etc. One hundred percent, my husband and daughter, are my why. I want to extend my life (God willing) as long as possible, to ensure I maximize my days of adventure, laughing and making memories together. Additionally, it is empowering to help others become fitter (physically, mentally and emotionally), healthier and happier. It is so inspiring to watch moms smiling through a tough workout. Positivity like this is contagious and it spreads to everyone in the room. So not only do you walk away feeling satisfied, but rewarded by your work and therefore happier. You only have one life. Why not make the most of it? Color and variety…I love trying out new recipes and using new foods with each trip to the grocery store. This keeps my family energetic about meal time and helps us get a variety of food groups, which improves dietary patterns. For example, some vegetables and fruits are good sources of vitamin C or vitamin A, while others are high in folate, and others are good sources of calcium or iron. Choosing a variety of foods within each food group helps ensure healthy combinations of nutrients and other beneficial substances. I served seven years on Active Duty in the United States Air Force before going in the Reserves. I have been stationed in Alabama, Arizona, D.C., Delaware and served two deployments in both Afghanistan and Qatar. I am third generation Air Force. My grandfather was Military Police and served during the Korean War, my father was a pilot for 33 years and continues to serve as a federal civilian in his retirement; he is my hero! I am a college football fanatic (War Eagle), triathlon enthusiast and small business owner as an international protocol and etiquette consultant. I can’t wait to meet each of you and share many mom memories! Come jam with me at my next class!